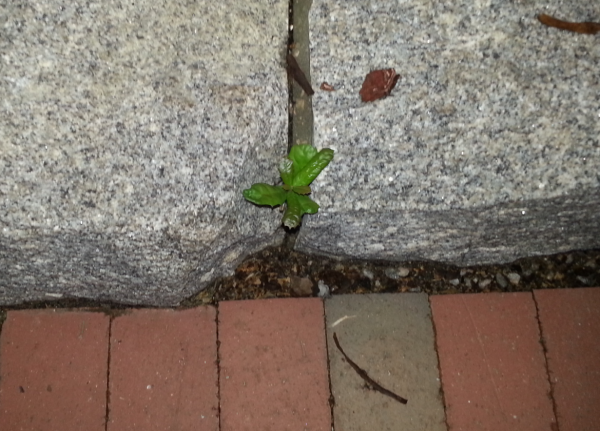 Less than two weeks after the Toomer’s Oaks were cut down (but not completely removed), and its predecessors either harvested or trampled, there it is: the first rhizomic shoot from the oak closest to College Street, working its way from the tree’s still very much alive roots toward the sun through a crack in the stone planter. Until the trees are completely removed after the football season, there will be more, possibly hundreds. They, too, will be collected and sold. Watch a video of Dr. You Know Who talk about it all here. Related: Most viral Auburn photo ever? * The Real Auburn Tiger is Real! * Sexist Auburn photo ever?